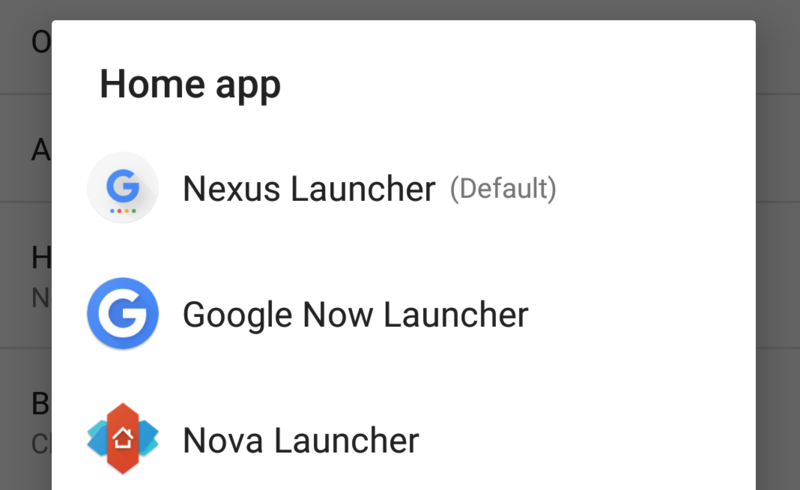 The APK for the new "Nexus Launcher" we detailed yesterday is now floating around the internet, but I've yet to see anyone point out one rather important detail about the whole thing: it doesn't replace Google Now Launcher when installed, but rather is clearly separate in name and branding. Going to the launcher picker with Nexus Launcher and Google Now Launcher installed, you can see both sport different logos and, obviously, names. Now, this in and of itself is not direct confirmation of the Nexus Launcher being a standalone app, but it seems like a pretty decent bet to make. This leads us to another question: will the Nexus launcher only work on Nexus devices, or does Google plan to make "Nexus" a software branding? Also: what will happen to Google Now Launcher in either scenario? If Google intends to make a launcher specifically designed for Nexus devices, that could mean Google Now Launcher would live on as the non-Nexus Google launcher. That would be interesting, though also a bit confusing: why would Google maintain two launcher experiences? The one possible answer is that the Nexus Launcher may be leveraging the new navigation buttons and Assistant functionality as part of its design philosophy, including the multi-colored home button that we now believe will serve as a shortcut to Google Assistant. If a device doesn't have the new home button (or incorporate its functions, rather), the Nexus Launcher may not provide the experience Google would want on a non-Nexus device. Thus, Nexus Launcher. Between that and the always-listening hotword (with display off, I mean) being a relative rarity on non-Nexus smartphones, maybe this is Google's way of finally saying "we're done building a launcher to the lowest common denominator - this is the launcher for our phones that do Android our way." Personally, I lean toward this general outcome, though I'd consider it a very open question what Google Now Launcher's fate would be. After all, if Google opened up the Now pane as an API to launcher developers (and there are hints this may happen), GNL wouldn't have too much reason to exist anymore, would it? In that scenario, Nexus Launcher would be a de facto replacement for GNL on Nexus devices, with GNL's primary reason for existing being parted out to third party devs who've been begging for it for years. At that point, GNL could probably safely be deprecated. A second explanation, and one that would be quite a bit more radical in terms of the Nexus name's future, would be that the Nexus Launcher is, in fact, intended to be a wholesale replacement for GNL that will work on non-Nexus devices. The idea here being that the Nexus Launcher gives you a "Nexus experience" on a non-Nexus smartphone. This does seem counterintuitive, I admit, but hear me out: between the Android clock, calculator, camera, messenger, dialer, and contacts apps, we have a bunch of software Google develops and maintains that works (to varying degrees and intentions) on non-Nexus phones but that really doesn't have any kind of brand identity. What if Google rebranded all of these apps to be "Nexus" apps? Crazier things have happened, though I have no evidence to suggest Google plans to do this. I'm just trying to keep an open mind to the possibilities. Either way, the fact that this app is called the Nexus Launcher means something is changing, and that the Google Now Launcher likely won't be Google's central point of launcher development going forward.